Srinagar: Violence and arson continued unabated in Kashmir Valley for the third day today even as National Security Adviser Ajit Doval rushed home from Kenya to join in efforts to defuse the turmoil that has claimed the lives of 23 people. As Kashmir remained on the boil and normal life paralysed due to curfew-like restrictions and separatists-sponsored strike over the killing of young Hizbul commander Burhan Wani on Friday, mobs torched a police station in Sopore and targeted the air force airport in Pulwama along with other security installations in Kashmir. There was also no let up in stone pelting incidents. A total of 800 additional personnel from the central paramilitary forces are also being rushed to Jammu and Kashmir. The reinforcements will be in addition to 1,200 personnel sent to assist the state police on Saturday. 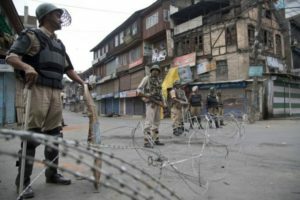 “Two persons have died in an incident of violence in Kulgam district yesterday and have been identified as Feroze Ahmad Mir (22) and Khursheed Ahmad Mir (38),” a police official said. With this, the death toll in the violence has gone up to 23, including a policeman. Around 250 people were also injured. A group of protesters pelted stones towards the air force airport at Koil in Pulawama this morning, a police official said. They also set afire the dry grass inside the airport complex. Security forces tried to chase away the mob but the attackers were regrouping and intermittently hurling stones, he said. Stone pelting incidents were reported from Sopore, Handwara, Bandipora and Baramulla in north Kashmir, the official said. Protesters torched a police station at fruit market in Sopore, police said, adding the men, arms and ammunitions and records were safe. Doval, who was rushed home 24 hours early by Prime Minister Narendra Modi in view of the tense situation in Kashmir, is regularly taking stock of the developments in the Valley with officials. Doval was accompanying the Prime Minister on his four- nation tour of African countries — Mozambique, South Africa, Tanzania and Kenya. They were due to return home tomorrow. “If there are problems, there are solutions. We are quite confident & competent of finding solutions,” he told PTI when asked to comment on the situation in Kashmir. The NSA did not elaborate but official sources expressed confidence the situation would be under control in 72 hours. “People of Kashmir are law-abiding and solidly against terrorism. They believe in peace, prosperity and development,” said a government official. At the same time, government sources asserted that those holding the gun and targeting civilians or security forces would be dealt with sternly. Union Home Minister Rajnath Singh reached out to opposition leaders including Congress chief Sonia Gandhi and former Chief Minister Omar Abdullah, and discussed the prevailing situation there. Omar later said he has told the Centre that violence in the Valley will not end until the security forces exercise maximum restraint and stop killing protesters.